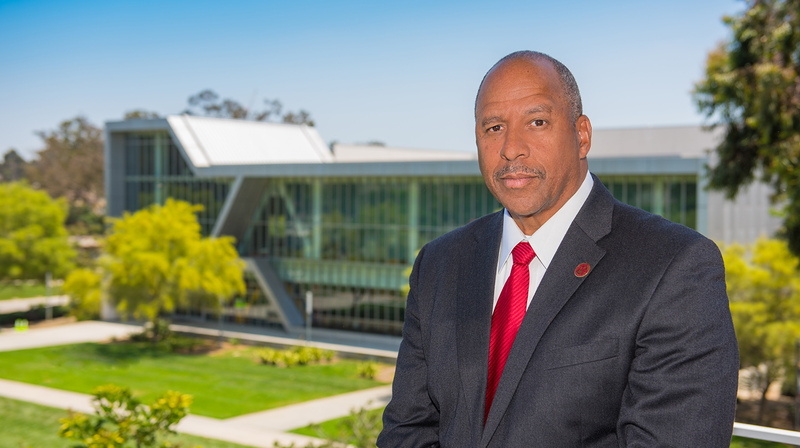 Though he was appointed last March and his first day on the job was in June, it’s taken some eight months to plan an inauguration week for Dr. Thomas A. Parham, California State University, Dominguez Hills’ ninth president in its nearly 60-year history. The theme of the week is “Transforming Lives that Transform America,” which was chosen by Parham to honor his past mentors and set the tone of his presidency, one goal of which he has stated is to nurture a new generation of local and national leaders. The first full week of February will be booked with specially planned activities in honor of both Parham and the university’s history. The keystone event is Friday’s investiture ceremony, which will run from 2 p.m.-6 p.m. in Ballroom C of the Loker Student Union. The ceremony, which has its roots in the Middle Ages, is a symbolic academic tradition that honors the pursuit of knowledge, according to the CSUDH inauguration website. The formal ceremony includes many “long-standing academic traditions and protocols,” including a procession of delegates from other colleges, as well as faculty members from CSUDH. Inauguration week events the next six days include an exhibit that runs from Tuesday to Sunday in the Archives and Special Collections area on the fifth floor of the library. “Transforming Lives: A History of CSUDH,” will cover key moments from when the college was first established in 1960 through the e present day. A key part of the exhibit is “The Pathway to Presidency,” a look at Parham’s life and academic career, as well as highlighting past CSUDH presidents. Wednesday, Feb. 6 is “Homecoming: Toro Days,” in which students can don formal attire and participate in a student-led dinner located in the LSU. The dinner begins at 5:30 p.m. and lasts until 9 p.m.
Thursday, the day before the investiture ceremony, California Attorney General Xavier Becerra will deliver a lecture, “Fighting for a Sustainable Future and Healthy Communities.” Following the lecture, Becerra will be joined by CSUDH professor and biology chair John Thomlinson, Watts Labor Community Action Committee President/CEO Tim Watkins, and CSUDH’s CalFresh Outreach Coordinator, Hawk McFadzen for a panel discussion. Friday’s formal ceremony is already sold out, but there will be a stream aired in several LSU rooms, and a video stream over the internet will be provided to those who want to watch at home. Inauguration week comes to a close on Saturday, with the Inauguration Gala Fundraiser for the Presidential Scholarship Program held at the Ritz Carlton in Marina Del Rey. The black-tie fundraiser provides multiple opportunities for donors to show their support for the school. All proceeds will funnel back to the Presidential Scholarship which offers recipients scholarships to CSUDH.?. You can find information for all of these events in the link below.